Buy Koko Dairy Free Original + Calcium 1ltr in the UK from our online shop or directly from our independent Scottish store. This dairy free alternative to milk is ideal for breakfast cereals, tea or coffee, sweet or savoury cooking , on its own as a refreshing cold drink. A thick, warming traditional Irish dish, with Dulse seaweed for an extra rich savoury flavour. This recipe contains 500ml coconut milk. 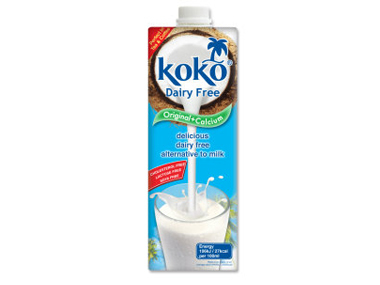 We sell real Koko and other Dairy Free Drinks & Creams directly from our shop in Scotland and online throughout the UK. View more products from Koko. Where can you buy real Koko Original + Calcium safely online? If you are wondering where you can buy Koko Dairy Free Original + Calcium 1ltr safely online in the UK, then shop with us. Koko Original + Calcium - Koko Dairy Free Original + Calcium 1ltr in Dairy Free Drinks & Creams and Drinks.